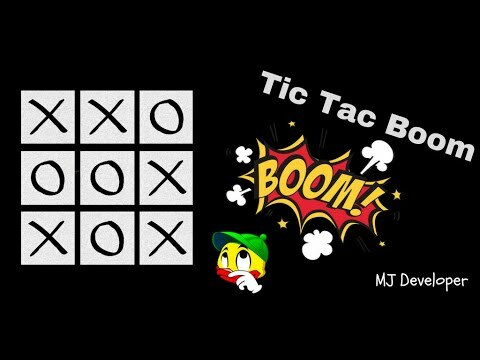 Tic Tac Boom Game is a game for Two players, called “X” and “O”, who take turns marking the spaces in a 3×3 grid. The player who succeeded in placing three respective marks in a horizontal, vertical, or diagonal row wins the Tic Tac Boom game.Play Tic Tac Boom on your Android phone. No need waste paper to play puzzle games! Now you can play Tic Tac Boom on your Android device for free. Our new modern version appears in a cool glow design.Features:Classic Noughts Crosses board 3 x 3 where 3 in a row wins.Single and 2 player mode (Computer and human).One of the best puzzle game in the world.2 players game (multiplayer).Background Music and Sound Effects.Multiplayer XO mode. No Complicated Interface. The Tic Tac Boom is a great way to pass your free time whether you’re standing in a line or spending time with your kids. It is often used as a pedagogical tool for teaching the concepts of good sportsmanship and the branch of artificial intelligence.Download Free Tic Tac Boom now and let the fun begins! – More Game Tab- Improve UI. - More Game Tab- Improve UI.